In a gruesome incident, which has once again sent shock waves through the Capital, a four-year-old boy was stabbed to death and his two elder sisters seriously injured when their domestic help attacked them with a knife in their North Delhi locality flat in the wee hours of the morning. Two more persons died of dengue, taking the toll to 42 in the national Capital, which reported 89 fresh cases of the viral disease today. After several days of dry weather, Delhi today experienced light rain which cooled down the metropolis on the eve of Divali, which usually marks the onset of winter. In an important ruling regarding the Delhi Sikh Gurdwara Management Committee (DSGMC) polls, the Supreme Court has laid down that any challenge to the election of the Sikh body constituted under a special statute could only be made through an election petition not by an ordinary writ. The employees of Haryana Government have announced to go on a one-day statewide strike on December 14 in protest against the “anti-staff” stance of the government and its ‘failure’ to solve the various issues pending for long. A petition was filed before the Delhi High Court today seeking registration of criminal cases against certain Delhi police officials in connection with the alleged suicide last week of suspended police officer, Inspector Devender Manchanda. Tributes were paid to Krishna Devi, mother of Indian Youth Congress president Ashok Tanwar at a condolence meeting today which was attended by several senior Congress leaders. She passed away on October 14 at RML Hospital following acute illness. A worker was killed when a boiler exploded in a vegetable oil factory located on Bulandshahr Road here yesterday. Another worker was badly charred. The Noida Authority has launched a new scheme of flats for all categories of people ranging from economically weaker sections (EWS) to higher income groups. Application forms priced at Rs 750 will be available by October 27. The domestic help, identified as Sanjay, was absconding and efforts were being made to trace him. The police said he hailed from Madhubani district of Bihar and teams had been rushed there. His description has also been flashed to all police stations. Senior police officers, the Crime Branch team and the Dog Squad also visited the scene of the crime. The bedroom was dusted for fingerprints. According to the police, the suspect reportedly stabbed Pratham Aggarwal and his two sisters, Prerna and Akriti, aged 13 and nine respectively, with a kitchen knife. Their parents were asleep in the other bedroom and did not hear any thing as the air-conditioner was on. While the four-year-old boy succumbed to injuries, the girls had been admitted to Sunder Lal Jain Hospital in a critical condition, the police said. The police said robbery was not the motive behind the attack as nothing was found missing from the house in Roop Nagar locality. They suspect it was a result of resistance by the girls to a molestation attempt by the suspect. According to the police, Sanjay was hired by the Aggarwals just four days ago and he had been introduced to the family by a driver known to them. 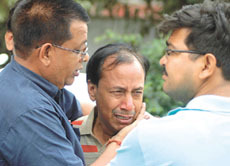 The driver, Jeetu, has been questioned by the police to ascertain Sanjay’s other acquaintances. Meanwhile, the police have once again reiterated the importance of having domestic help registered with the local police. Riaz (65), a resident of Muzaffarnagar in Uttar Pradesh, and Yashpal (32), hailing from Palam in South-West Delhi, died late last night at AIIMS, where 180 persons have been admitted for treatment of dengue and related illness. He died due to multiple organ failure. The patient was in a state of shock because of the illness. Yashpal was admitted to the hospital on October 17 in a serious condition. His platelet count had been dipping ever since he was admitted. He also died of multiple organ failure. The situation is deteriorating with each passing day. Health officials said despite their best efforts the view was that the outbreak could be controlled only by mid-November. Delhi Health Secretary D. S. Negi said the government was doing its best to control the disease. But it was still spreading. Dengue cases continued to rise in the Capital where 89 patients were admitted to various hospitals during the past 24 hours, the Municipal Health Officer, Dr N. K. Yadav, said. Altogether 1,820 dengue cases have been reported in the Capital till now of which 1,144 were from the Capital and others from outside Delhi, he said. At AIIMS, 53 patients were admitted to the hospital and nearly 150 persons with suspected dengue had been kept under observation at various wards, Medical Superintendent D. K. Sharma said. Light rainfall in and adjoining areas of the Capital led to a drop in temperature, raising hopes for a natural solution to rid the city of the deadly fever. The Aedes mosquito thrives on hot, humid and high temperature, which is anywhere between 20 degree Celsius to 30 degree Celsius. However, the temperature needed to drop to 16 degree Celsius at which the Aedes mosquito did not survive, the experts said. Rain and thundershowers, followed by an overcast sky since early today, brought down the minimum temperature from 24 degree Celsius last night to 21.7 degree Celsius this morning. Though only 1.2 mm of rainfall was recorded, the Met Office has forecast more rain and thundershowers during the next 24 hours. According to the Met Office, the sudden turnaround in weather was because of the build-up of a western disturbance. Under the influence of the disturbance, heavy rainfall is expected in many parts of north-west India and scattered rain in Delhi and its neighbouring areas during the next two to three days. Also, the Met Office has forecast a drop in mercury in the coming days. The last few days have witnessed a constant drop in mercury in Delhi in the run-up to Divali. Any writ petition challenging the election to the DSGMC was not maintainable, the bench ruled. The court said since the Delhi Sikh Gurdwaras Act, 1971 provided proper management of the Sikh gurdwaras in the Capital and has laid down a proper procedure for holding of the elections to the committee and its executive, any challenge to the same would arise only by way of an election petition. The ruling came on an appeal by former DSGMC President, Mr Avtar Singh Hit, and three other petitions challenging the Delhi High Court division Bench order overturning the judgement of its single judge Bench directing re-election to the executive held on December 19, 2005. Dismissing their appeals, the apex court upheld the High Court division Bench order. It said the single judge was not right in deciding the matter in writ petition and it was liable to be dismissed. “The writ petitions filed by the appellants were not maintainable having regard to the controversy raised which was purely factual in nature and could more appropriately be decided in an election petition which remedy was provided by the Delhi Sikh Gurdwaras Act itself, ” the judgement said. In the wake of the ruling, the court refused to take into account the arguments by senior advocate, Mr Soli J Sorabjee, for Hit, that the division bench had not taken into account the fact that some members of the DSGMC were not issued due advance notice for December 12, 2005 meeting in which election date was decided. Since the polls have to be challenged by an election petition and it was the settled question of law, no relief could have been granted to the writ petitioners, it said. Hit, a supporter of Shiromani Akali Dal headed by Mr Parkash Singh Badal, had accused the rival faction leader Mr Paramajit Singh Sarna, who was the president of the DSGMC at the relevant time, that some members of the executive were not deliberately invited by him in the December 12 meeting. He had claimed that only 35 out of 50 members had attended the meeting and it had not constituted the quorum to decide the date of election. However, the court refused to take all these factual aspects into account. The call for the strike has been given by the Sarva Karamchari Sangh, Haryana, (SKS), a leading employees’ association in the state. The government employees would also hold protests and demonstrations on November 14 throughout the state, besides a state-level rally at Karnal on October 29. According to Mr Punam Chand Ratti, president of the Sangh, thousands of the Sangh’s members who took part in the regional rally held recently at Ballabhgarh had favoured for such an action to register the ongoing resentment against the “non-cooperative” attitude of the government towards their demands, which, he alleged, had been persistently being overlooked without any justification. He blamed the government and its officials for making a “mess”, while carrying on its policies of “privatisation and victimisation” of the government staff. Despite the fact that there had been a large number of vacant posts lying in various departments, the authorities had still been following the policy of retrenchment and outsourcing the services to private companies on a large scale, Mr Ratti alleged. Assailing the government for not reinstating about 1,519 ‘sacked’ employees of the Municipal Corporation, Faridabad, and keeping over 25,000 posts vacant in various departments, he alleged that there was no difference in the functioning and policy of the present government than that of the previous government. The Sangh also criticised the Hooda government for the way it dealt with the labour unrest at Liberty Shoes of Karnal, accusing it of favouring the management than the interests of the labourers. Mr Ratti said the employees would not bow to the police pressure and the unjustified action of industrial units anywhere in the state. He added that several issues that required an immediate solution included the demand of giving up the policy of privatisation and outsourcing in various departments, filling up the vacant posts, promotion and bonus to staff, ex gratia policy, regularisation of Anganwadi workers and thousands of staff in other departments, and the immediate implementation of the demands that were reportedly accepted in a meeting with the Chief Minister held on March 9 and May 17 regarding various issues. The petition filed by late Manchanda’s son, Prashant, sought registration of cases against some senior Delhi Police officials for allegedly abetting the suicide. A Division Bench of the high court listed the matter before an appropriate Bench for hearing on October 30. The Kavi Nagar police have registered a case against the owner of the factory. According to eyewitnesses, Naresh Tyagi, 45, from Dahru Heda and Shankar, 32, from Jharkhand were working in the factory around 6 am. They had increased the temperature of the boiler, which went up higher than the normal limit. As Naresh Tyagi tried to lift the lid off the boiler, it exploded with a big bang, killing Naresh Tyagi on the spot. Shankar was badly charred. He was rushed to a private hospital. The Noida Authority has launched a new scheme of flats for all categories of people ranging from economically weaker sections (EWS) to higher income groups. Application forms priced at Rs 750 will be available by October 27. A total of 2,150 flats will be constructed that will be allotted as per a lottery system. The applications can be submitted from October 27 to November 27. The construction work of the flats is expected to be completed within next two years. These flats will be available on four floors. The 400 EWS flats each constructed on 31 sq mt will be priced at Rs 7.84 lakh and Rs 85,000 will be the registration amount for this category. The LIG flats, constructed on 54 sq. mt area, will be priced at Rs 13.31 lakh each. The registration amount for LIG flats will be Rs 1.40 lakh. Some 1,050 LIG flats will be constructed.